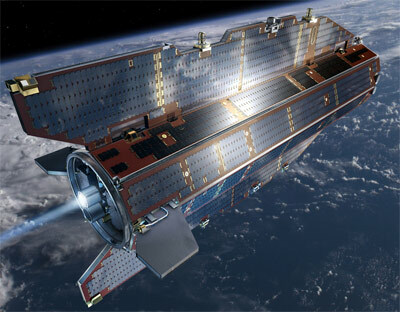 GOCE (Global Ocean Circulation Explorer) is the first in the European Space Agency's Earth Explorer Core Missions within the framework of the Living Planet (Earth observation envelope) programme. It will complement the existing CHAMP and GRACE missions. GOCE's mission objective is to provide models of the Earth's gravity field and of its equipotential reference surface on a global scale with high spatial resolution and very high accuracy. This will not only help to extend understanding of the Earth's interior structure and seismic processes but also of aspects such as ocean circulation, ice sheet topography and evolution and thus global sea-level change. The design definition phase for the programme has been achieved in May 2002 with the successful completion of the Preliminary Design Review for the GOCE space segment. The orbit of the satellite must be as low as possible to observe the strongest possible gravity-field signal – hence GOCE has been designed to skim above the Earth at a height of just 250 km. Its slim elongated form enables it to cut through the wisps of atmosphere that are still present at this height. The need to fly low and be ultra-stable has lead to a novel satellite design that minimizes air drag and torque and excludes mechanical disturbances. The result is a slim 5 meter-long satellite with a cross sectional area of about 1 m² and weighs in at about 1050 kg. The satellite is symmetrical about its horizontal plane and has two winglets that provide additional aerodynamic stability. Once in orbit, the same side of the satellite remains facing the Sun. The satellite is equipped with four body-mounted and two wing-mounted solar panels, which use triple junction Gallium Arsenide solar cells. Due to the orbit and satellite configuration, the solar panels will experience extreme temperature variations. The design has therefore had to include materials that will tolerate temperatures as high as 160°C and as low as -170°C. One S-band communication antenna is mounted on each wing. One faces upwards and one downwards so that full spherical coverage is achieved. The wing that points towards space carries two GPS antennas. a laser retroreflector to enable tracking by ground-based lasers. The advanced drag compensation and attitude-control system is a key feature required to keep the accelerometer sensor heads in near 'free fall motion' and to maintain the orbit altitude at about 250 km. The system is based on ion-propulsion technology. A particular feature of the GOCE system design is that the drag-free and attitude-control system uses the scientific payload as a sensor. In addition to the fusion between 'satellite' and 'measuring device' in terms of scientific data quality, there is therefore also some fusion between the satellite system and the measuring device in terms of how the GOCE satellite will actually operate. GOCE ran out of fuel on 2013 and finally reentered the atmosphere and burned mostly up on 11 November 2013.